I’ve got the jitterbug. | Pulp and Circumstance, Juiced. You must venture over and listen to the latest installment one of my favorite podcasts, The Uncensored History of the Blues. Centered around drug imagery in early blues music, Mike Rugel takes listeners on a comprehensive trip (pun intended!) 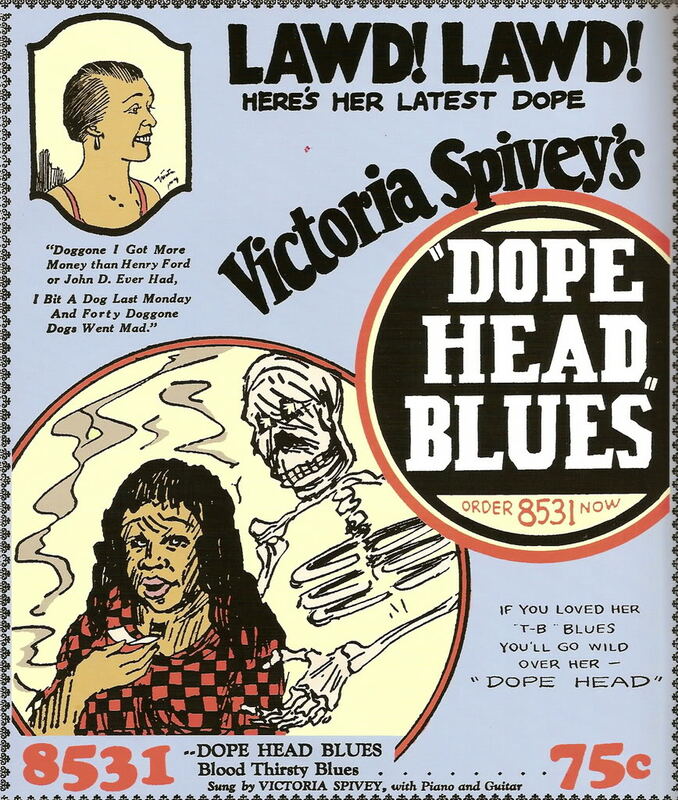 through Dope Head Blues from the likes of Victoria Spivey, Washboard Sam, Jazz Gillum, and Half Pint Jaxon, to name a few. Drug use and music have gone hand in hand for decades; centuries, in fact. Whether illegal or not, it was an integral part of the blues music scene, and was mentioned often in the tunes. And what’s really a better topic for the blues besides losing your woman and being broke than drug use and all its ill effects. Most of the tracks mention the downtrodden after effects of a life of drugs, the deliriums, and of course, the slammer. While many of the tunes mention reefer use, cocaine was prevalent in the Mississippi Delta, particularly with river workers. Along Beale Street, in Memphis, Tennessee, pharmacies had it on hand in various forms. Of course, Beale Street is known as one of the epicenters of blues music in America. Even traditional Appalachian folk tunes and jug bands mention cocaine use–like “Cocaine Blues”, written by T. J. Arnall, which is in fact a rewrite of famed Appalachian tune “Little Sadie”, a murder ballad alternatively known as “East St. Louis Blues”, “Late One Night”, and “Bad Lee Brown”. The podcast is put together by the amazing Mike Rugel of the Delta Blues Museum. You can take a trip through anything P&C has written previously about the podcast, or visit the Uncensored History of the Blues site. This entry was posted in blues archive, jwolf and tagged blues, podcast, uncensored history of the blues. Bookmark the permalink.